December 25th, 1955: Charlie Watts is given his first drum kit for Christmas. December 25th, 1977: it is hard to find any christmas related thing at the Rolling Stones. 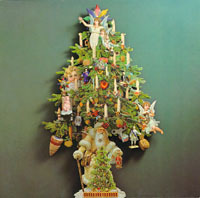 Teldec germany released a strictly to 1978 copies limited christmas album, which was not for sale, but a christmas gift to some of their customers. Among various artists The Rolling Stones are there with "Satisfaction".